We all know smoking is really bad for our health. But do you know what some of the thousands of chemicals in cigarettes are also used for? Inhaling stuff from batteries, toilet cleaner, insecticide and rocket fuel, should really make you stop and think. Smoking dates back to as early as 5000 BC in the Americas, in Shamanistic rituals. The first European to discover smoking was Christopher Columbus in 1492. His diary entry on 15thOctober said that he had observed a Native American sailing in a canoe with water, food and tobacco leaves. In 1531, tobacco was cultivated for the first time by Europeans and by 1600 its use had spread across Europe and England, also being used as currency. Fast-forward a few hundred years and smoking was ubiquitous and considered cool. It was cheap, legal and socially acceptable. In the 50s it was considered classy and glamorous, in the 60s widely accepted as part of everyday life. In the 70s and 80s, people became more concerned about smoking and health. Then attitudes began to really change. The 90s saw the introduction of anti-smoking and public awareness campaigns and then in the noughties, the smoking ban came into effect - which resulted in smokers being banished outdoors, alongside elevated taxes making it an extremely expensive habit. So, cool or not, what about the effects on human health? According to the NHS, smoking remains the biggest cause of preventable illness and premature death in the UK, claiming around 80,000 lives each year. It is a huge burden on our National Health Service. With these known statistics, it’s hard to understand why we continue with this life-threatening act - damaging not only our own health but posing a risk to those around us. So, if human health and price doesn’t deter the ardent puffer, or the graphic warning messages emblazoned on today’s packaging, what if you knew what your cigarettes really contain? 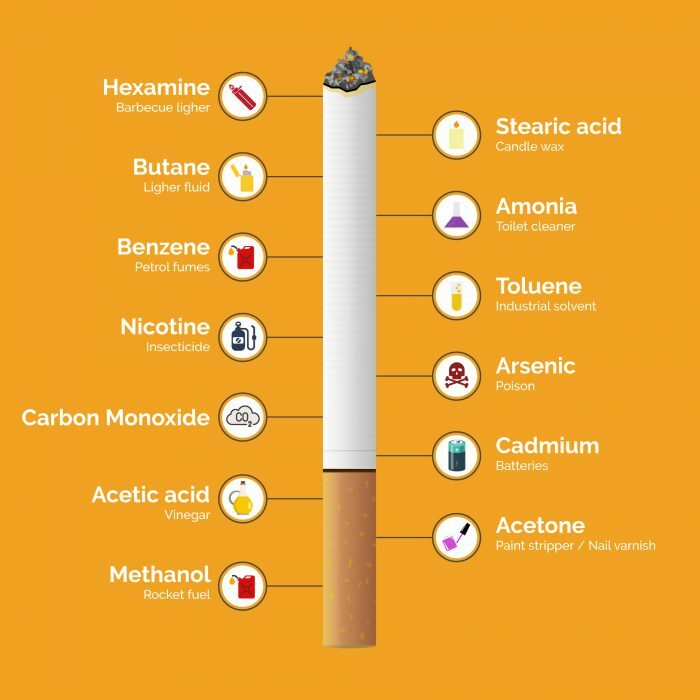 Oh, and don’t be fooled that ‘rollies’ or ‘menthol’ cigarettes are any better for you as they still contain the same cancer-causing chemicals. When a cigarette burns it releases a dangerous cocktail of more than 7,000 different chemicals, many of which are poisonous and known carcinogens. Some of these are added when the leaves are processed while others form when a cigarette burns, so are only in the smoke. When this is exhaled this is known as ‘second-hand smoke’ or ‘passive-smoking’, which can move between rooms, and when inhaled puts other members of the household at risk. Opening a window or increasing ventilation will not really protect you, as there is no risk-free level. So, before you reach for the packet, take a look at what these cancer-causing chemicals are also used for. Do you really want to be inhaling them and forcing those around you to do the same? To make sure your home is safe book an air quality test today.